Since The Alley is starting off on a new foot, I thought this was a good time to discuss the past of our transit system. I was a child in the 1970s and a teenager in the early 1980s, when the Metropolitan Transit Commission buses were known as the “Big Red” for their color scheme. Before 1982, the adult fare was the same at all times of day, but discount fares for senior citizens, people with limited mobility, and students only applied during non-rush hours from the mid-1970s on. I remember finding it odd that children got a discount during school hours and at night, but not right after school, when it would have been most useful. Until 1979, the senior citizen fare during non-rush hours was zero. 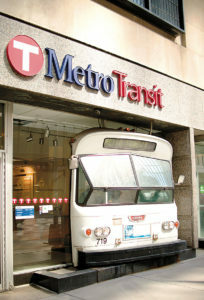 There was no Metro Mobility back then, nor did regular buses have wheelchair lifts. Around 1979, MTC started a pilot project called Project Mobility which offered door-to-door service for people not able to use the regular buses. It was almost a victim of its own success – the planners only anticipated a few users going to medical appointments or maybe grocery shopping once a week. However, the existence of Project Mobility enabled people with physical disabilities to dare to try to have more active lives. “Build it and they will come” was an understatement! Project Mobility was expanded into the modern Metro Mobility program by popular demand, and later, a federal mandate. The farthest out suburbs were what I called “next day” suburbs. That is, you couldn’t go there on the bus and return to the inner city the same day, because the bus service was designed for people who lived out there and worked downtown. Apple Valley, Burnsville, and Eagan were “next day” suburbs before the Mall of America opened! There aren’t many “next day” suburbs anymore, but Maple Grove and Forest Lake still are. A few others, as a practical matter, might as well be, such as Plymouth, downtown White Bear Lake, Cottage Grove, Newport, and Saint Paul Park, Circle Pines, and Lexington. Oh, the ghosts of transit past!